As even the liberal website Daily Beast is suggesting that President Trump must "Smash Facebook and Its Tech Oligarch Friends," providing some very real numbers and percentages regarding the stranglehold on information these "oligarchs" are abusing, we find a number of stories which give ample evidence that big tech's rampant abuse, manipulation of information, and censorship practices must be reined in. Google (Alphabet) has been humiliated once again by their reliance on Wikipedia for their "information panels, " as recently it was reported that when searching for "National Federation of Republican Women," the information panel to the right of the search results which describes their organization, showed users the description "The National Federation of Republican Enablers is the women's wing of the Republican Party in the United States." It then lists where they obtained their information, "Wikipedia." Google cited Wikipedia for the disparaging description, though Wikipedia’s page for the women’s group doesn’t contain that description. Wikipedia’s edit history shows on October 19 someone replaced the word “women” in the group’s name with “enablers.” The change lasted about five hours on Wikipedia before it was reversed. 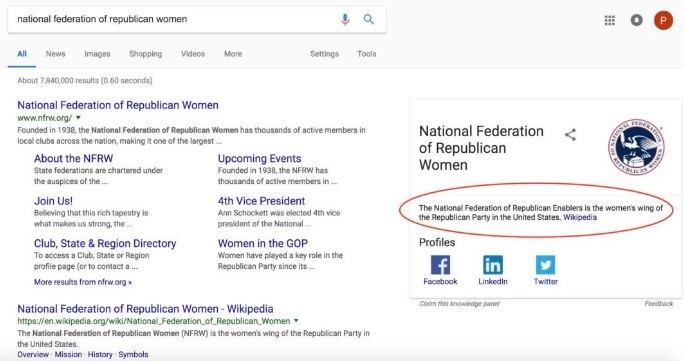 After the Daily Caller published an article showing how Google was falsely labeling Republican women, Google removed the knowledge panel from the search term. With Hollywood celebrities and liberals across the Internet are busy attacking "white women" for voting Republican, suggesting that others should "educate" them in order to get them to vote for Democrats, this type of vandalism should have been expected, yet three weeks after Wikipedia corrected the false information, Google was still showing it. 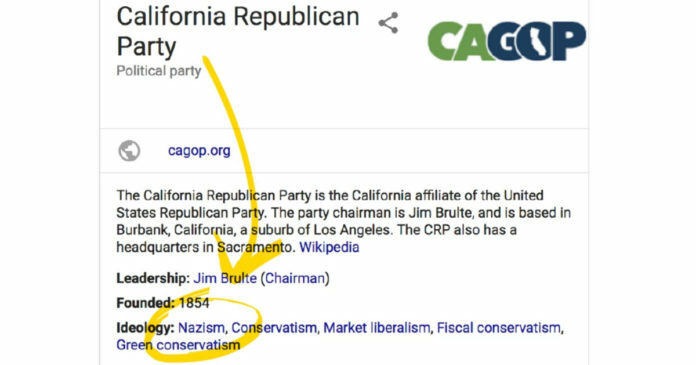 This is reminiscent of the last time Wikipedia publicly humiliated Google when earlier in 2018, the search results for "California Republican Party," falsely listed their ideology as "Nazism." At the time Google blamed "vandalism on Wikipedia," for the erroneous description that was shown on Googles results page, but that should not give cover to Google when they are clearly aware that Wikipedia allows questionable edits, fixing them at a later date, so Google appears less worried about being accurate than having someone else to blame when their own search page provides fake information. Their argument appears to be that regulating the company to limit their censorship practices, would have "disastrous practical consequences." Independent Media readers are already quite aware of how many conservative Independent Media websites have been adversely affected by big techs censorship practices. ANP recently dug through our data to find that in the two years since the 2016 presidential election we have seen a decrease of over three-fourths of ad revenue, from Google alone. Between the manipulation of search results making it very hard to find our articles and they downrank Independent Media while increasing access to liberal establishment media, that massively affects organic traffic, which automatically affects revenue generation. 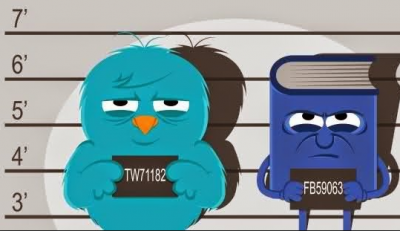 Independent Media websites with a conservative lean have been seeing those types of decreases across the board from Facebook, YouTube, Twitter and Google's censorship practices. • Nearly two thirds of readers now get at least some of their news through Facebook and Google—two companies that employ no reporters and are often in fact hostile to them. • Facebook and Google accounted for over 89 percent of the growth in online advertising in 2017, it’s exceedingly difficult for new publications to survive online given the dominance of the oligarchic platforms. • Google controls nearly 90 percent of search advertising. • Facebook controls almost 80 percent of mobile social traffic. While ANP saw the writing on the wall and stopped sharing the majority of our articles on Facebook months ago, which is another platform that has been purging conservatives, a high number of them right before the midterm elections, which eliminated over two billion GOP page views, others continued to be dependent on social media platforms, and have had their livelihoods destroyed by their censorship practices. Gab.ai is an ad-free social network dedicated to preserving individual liberty, the freedom of speech, and the free flow of information on the internet. Minds.com is a free and open-source platform to launch your digital brand, social network and mobile app. Openbook is an open-source, zero tracking, zero spying, zero advertisement, secure social network. Others include Digg, Steemit, Diaspora & more. Brighteon is a great alternative to YouTube. There are also a variety of other search engines that can be used rather than Google. Of course choosing wisely is important because smaller websites do not have the manpower to spend all day promoting their websites because it would limit their ability to produce new content, but bringing in new readers is vital to rebuilding a website that has been decimated by the censorship practices by Google, YouTube, Facebook and Twitter, since the 2016 presidential election. As evidenced by the most recent example of Republican women being labeled by Google as "enablers," the attacks against conservatives by big tech are still occurring after the midterm elections, which makes it all the more paramount to keep an eye on the lawsuits against them, the news of proposed regulations, and to find new ways to bypass their censorship. Readers can share with friends and family either through email or social media (if they use it.) Readers can also encourage friends and family to share and use a different search engine. Website owners can help each other by linking to other Independent Media sites within their articles. Website owners can also use alternatives to the social media platforms that are limiting their ability to reach new people. Until Congress, or the courts, put a stop to big techs ability to control what people see and where, it is up to all Independent Media sites and their audiences to work around the manipulations and rebuild. As always, we thank our awesome PipeLiners for all the help they have given to us during this battle. Below is a man named Mark Parham, a Democrat, speaking out against big tech censoring Republicans. He takes liberals to task for celebrating the censorship of conservatives, understanding that social media should be encouraging more ideas, more voices, rather than stifling voices they don't agree with.